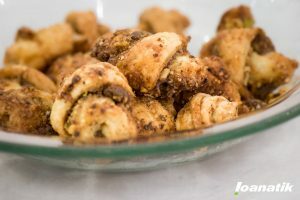 My grandmother, Pearl, used to make the most amazing Rugelach. They were by far my favorite thing she made. Whenever we would go to her apartment in the Bronx, she had them ready and waiting for my brother and I. As she got older, when she was able, she would freeze little bags of ruggies, so, even if she didn't feel up to making them fresh, they would still be there for us to enjoy. Grandma Pearl used to work for the City of New York sewing uniforms. One day she had slipped on ice on the way into work and hit her head. As a result of the injury, she lost her sense of taste and smell. The loss of key senses affected her enjoyment of life and her ability to cook, but, she kept on making ruggies for us. She made them into her early 70's and stopped when the arthritis got too painful for her to knead the dough. My mom told me that grandma called her one day saying that she was done cooking and had thrown her recipes down the incinerator. All those wonderful recipes and history were lost. 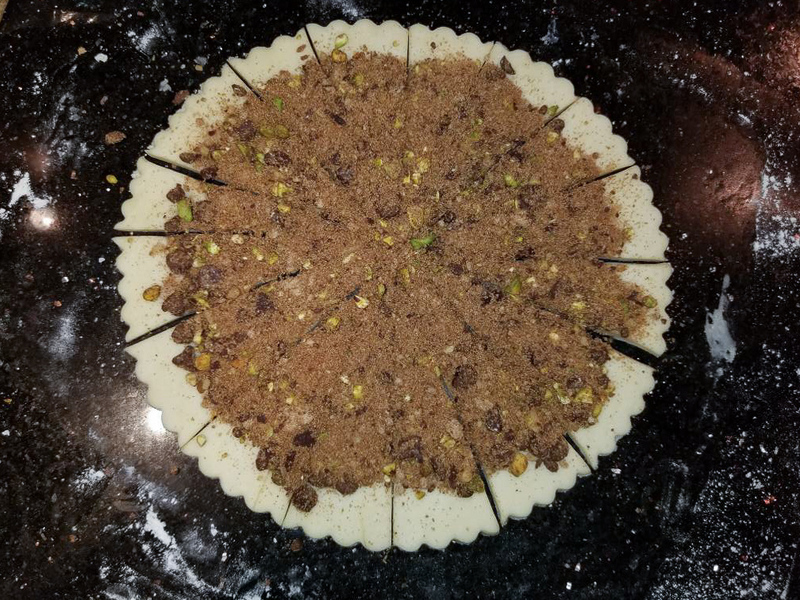 I have been trying to recreate Grandma Pearl's Rugelach recipe for almost 30 years. I tried recipe after recipe, but, they never quite matched the flavor and texture of grandma's. Each time I entered the recipe onto a spreadsheet and studied the ratios. I threw out countless batches as being too cakey or too sweet or just too blah. The recipe below is as close as I've come to Grandma's recipe and I'm sure that it's missing some elements of her version, but, it's close enough to bring back all the memories of her apartment in the Bronx. Grandma also made a fantastic lemon poppyseed cake, but, that will be the subject of a future blog post. 1/4 cup plump, moist dried currants, raisins or golden raisins. I usually work my dough by hand using a pastry blender. I usually take the cream cheese and butter out 30 minutes before I start cooking so that they have time to reach roomish temperature. I start by putting the flour and salt into one bowl and the cream cheese and butter into another. Then I'll whisk the dry ingredient together so that they're well mixed. Don't over work the dough. When the flour is incorporated into the butter and cream cheese, dump the dough out on a floured surface and split it into three pieces. Roll each piece to about 1/4" thick and letter fold it. Then wrap it in plastic wrap and leave it in the fridge overnight. 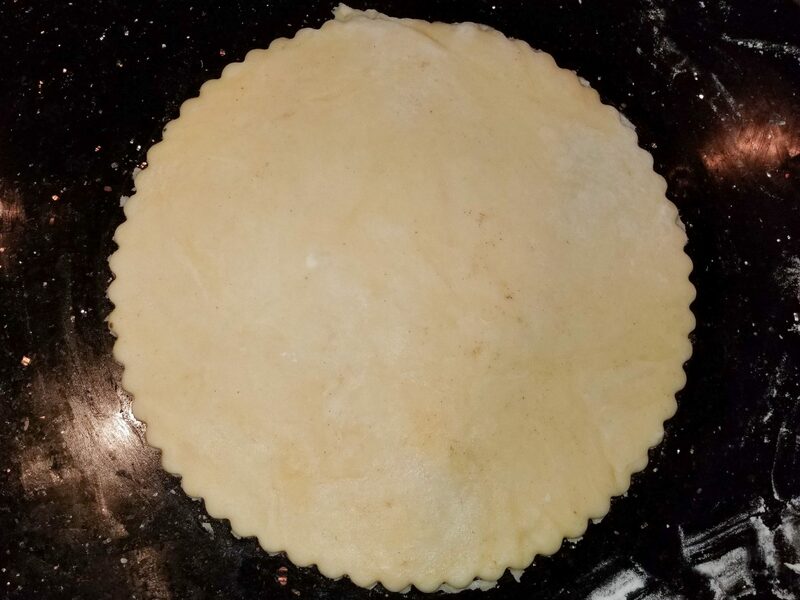 The next day, take one of the packets from the fridge and on a floured surface roll it to a square about 1/4" thick. 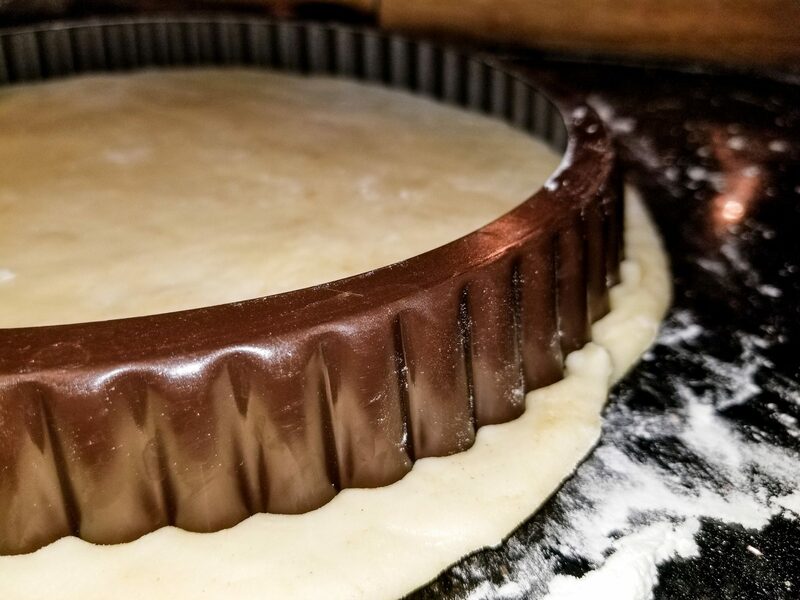 I use a scalloped 10" pie tin to cut a circle out of the dough. Then I use a pizza wheel to cut the dough into 8-16 small triangles. 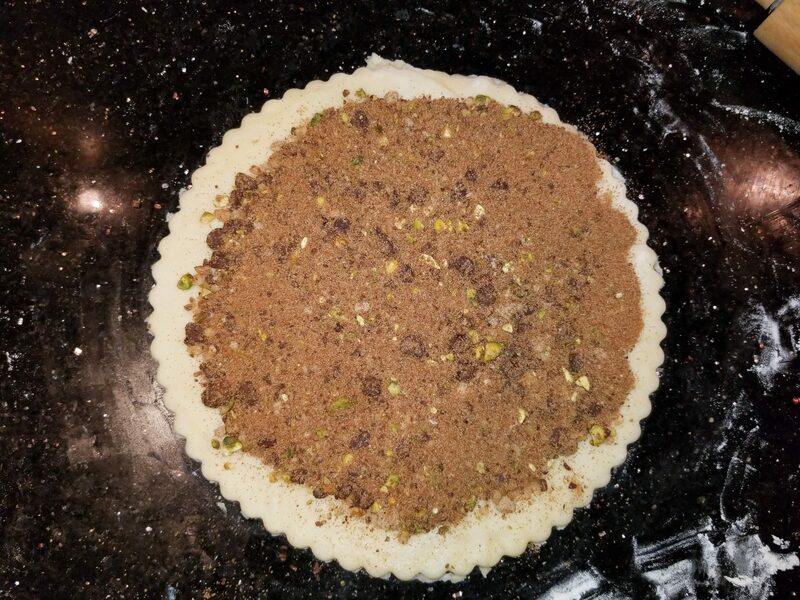 Put the filling on top of the triangles and press it into the dough. Roll the dough pieces from the larger end into the center making little crescents filled with sugary, nutty sweetness. Bake in a convection oven at 300-325 F for about 20 minutes. Don't over or under bake these. Pulse all the ingredients in a Cuisinart Chef's Mini Chop. Grandma never used a glaze on her ruggies and I really don't like it on mine. But, lots of people do enjoy the look and taste of a shiny caramel colored glaze. If that's what you'd like I would brush the uncooked cookies with 1 large egg beaten with 1 tablespoon Milk. Then sprinkle the wet glaze with 2 tablespoons coarse sugar. If these cookies last more than a day or two, something is terribly wrong. The uncooked dough can be frozen for up to 6 months. Ruggies don't need anything but a tall, icy cold glass of milk.